... I love writing hymns and songs (words and music) for my church, and I would love to share them non-commercially with anybody who finds them meaningful. 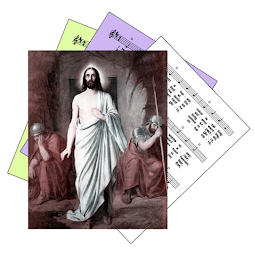 I have been self-publishing the sheet music for the hymns and songs, and I am making them available to use free of charge at my website. I’m struggling to find ways, though, to let people know it’s there! I have posted links on a couple of forums, and there have been some downloads, but at the same time, I don’t want to be intrusive. I was wondering, please, whether there might be an avenue through one of your websites? Or if not, do you have any suggestions that I might try, please? Rather than replying individually, I decided to share my thoughts in an article, because there are probably other hymn and worship-song writers /composers asking exactly the same question. 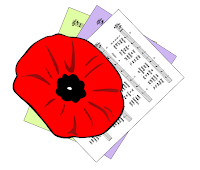 How can an independent hymn-writer promote their work? There is no one answer to this question. There are many things that hymn-writers in general do to publicize their material. Some of them will be appropriate for you, your material and your situation - others won't. All of them need time and effort from you, and some take money as well. You cannot possible do everything at the same time. 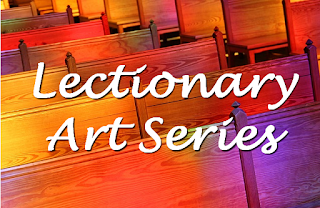 And as with any artist, there are no guarantees that the church will appreciate your work. Read through the list below (or skip to the summary at the bottom of the page if you just want an an overview), and choose a few things which you can and will do over the next three months. Ideally choose some face-to-face approaches and some on-line ones. Review your approach again in three months, see what has worked and decide what to to do next. As well as asking people you know to promote your work, at this very early stage you also need to make it possible for people to find your work: the starting point for this is the internet and social media,. Depending on your technical skills, it's possible that this will be harder than writing the songs was! But if you're serious about sharing your work, especially if you want to make a living from it, then it's what you need to do. If you use Blogger, you can do this for free, even making a "real website" for a very low cost (see how here). Or you can use Wordpress: it has more options, but is is more complicated to learn, and will cost you more unless you want a generic address. A full website is needed if you want a very slick or customised internet presence. Don't reply totally on social media. Social media platforms can and do changes their rules - and they choose who will see your material, and who won't. If their rules don't like your material, then it won't be shown. Even as I write this, Facebook is facing a lot of criticism about how a privacy issues, and there is a #deleteFacebook campaign running. Facebook will survive - but it won't be as large or strong as it was forever. Individual social tools will continue to come and go. People believe social media is a very twenty-teens phenomena. But really, the first social networks were bulletin-board systems, Usenet, IRC and other things that most people never heard of, way back in the 1990s. In the Twenty-zero's Bebo was popular - and then it closed down. All that really happened is that the platforms changed - and this will keep happening. If you want people to know and use your hymns and songs, then you simply have to give them the words. If your hymn becomes popular, there will be hundreds, maybe thousands, of unauthorized copies made. You won't be able to find every copyright violation. But by making you website the first source of the correct words, you make it more likely that people who search for the hymn will find your copy (not another), so you can benefit when they buy the sheet music or a recording. See Graham Kendrick's website for an example of this approach. 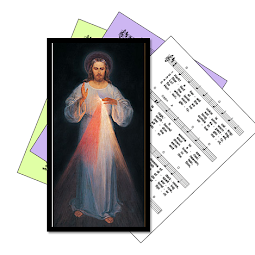 Many visitors to this website, and its sister-site Godsongs.net, are faithful church-volunteers who don't have formal musical training and audation skills - that's the ability to look at a piece of notation and "hear" how it sounds from the score. Many cannot play a piece at sight - that's just not how they "do" music. To share your hymns with these people, they need recordings. A YouTube channel is the simplest way of sharing these. And if enter good descriptions for each of your videos, YouTube itself works like a search-engine, helping people find your work too. And even if you are targetting musicians with more formal training, recordings let you share the nuances and artistic depth of your work in a way that it is very difficult for a score to show. Yes - having talked about all the issues with social media, I'm now recommending that you use it! Love it or hate it, Facebook and its counterparts are now in the picture for anyone who is promoting anything. The trick is to look at where the people who you want to promote your music to hang out - and then to hang out there and judiciously offer your works there. It's likely you will choose two or three platforms (eg Facebook, Twitter, Instagram, LinkedIn, Pinterest). If you're in an English-majority country, then it's likely that Facebook will be one of your options. Notice that some people who like your music (or who know others who would like your music eg their youth band or senior choir) aren't necessarily going to be your personal friends. 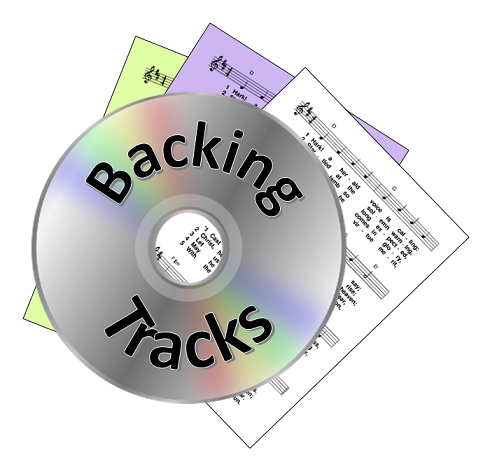 Maintain your own privacy and family /friend relationships by creating a Page for your music. You can still share songs on your personal profile with your actual friends, as well a sharing it on your Page with your fans. 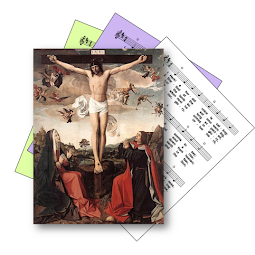 How exactly to promote your hymns depends on the tool(s) you choose. 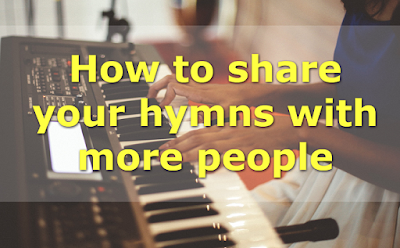 Study how the tool is used by other people to see how to make "friends" and join in conversations where you can naturally share your hymns. Participate in the community, don't just self-promote. But on the other hand, don't be shy to offer your works either. 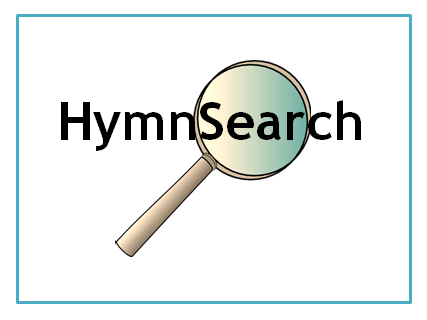 The first place where you can tell people about the days or event that your hymn are particularly suitable for is on your own website: include scripture references, themes, and suggested events with each hymn. A great example of this approach is the Carolyn's Hymns website which Google often suggests to me when I'm looking for hymns. 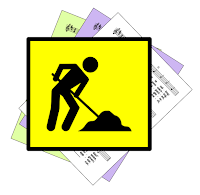 But you can also submit your work to be included in other people's lists of suggestions. 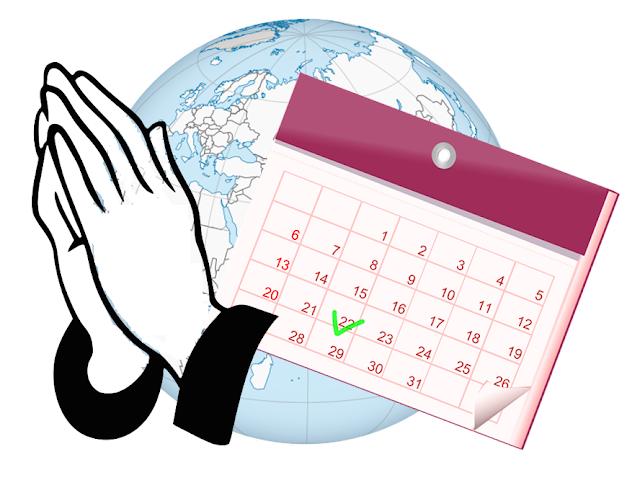 This is most effective if you figure out specific dates or events that your hymns are appropriate for, rather than making a general request. 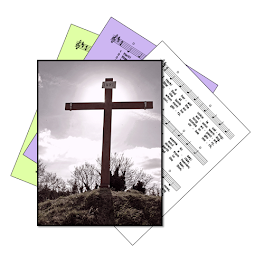 LiturgyTools.net includes a wide range of hymn-suggestion pages. 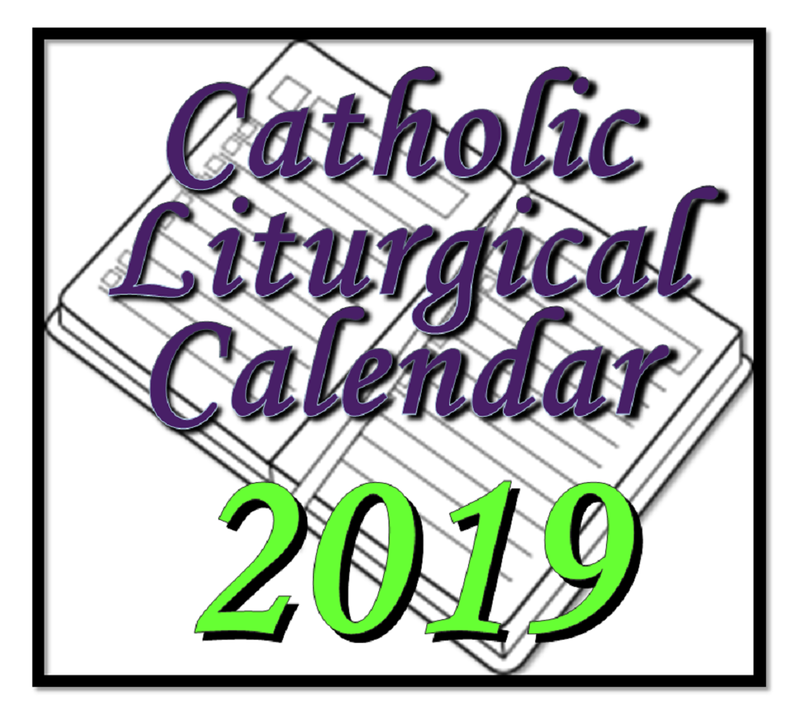 Many are based on the Roman Catholic lectionary readings - but there are others for a range of seasons, feasts and memorials, saints, days of prayer, and even some secular events that are marked with religious services. 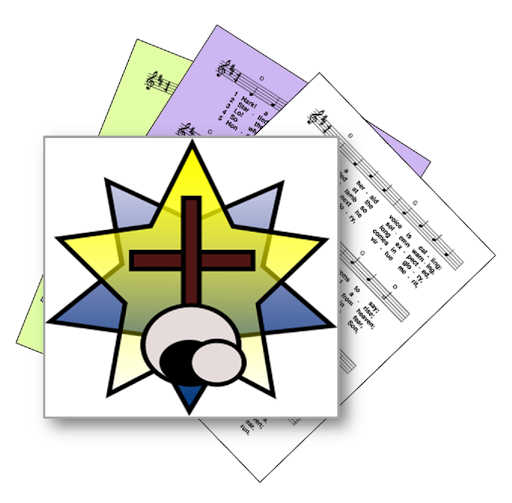 It also has links to other hymn-suggestion sites, for other churches and the Revised Common Lectionary. 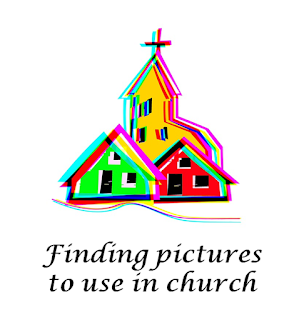 Your own church may also publish lists of suggestions, too. 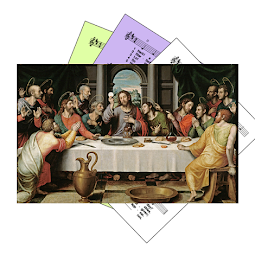 On LiturgyTools.net, if there is a clear link between the readings or ideas of a day and one of your works, then please point it out by leaving a comment on the appropriate page. 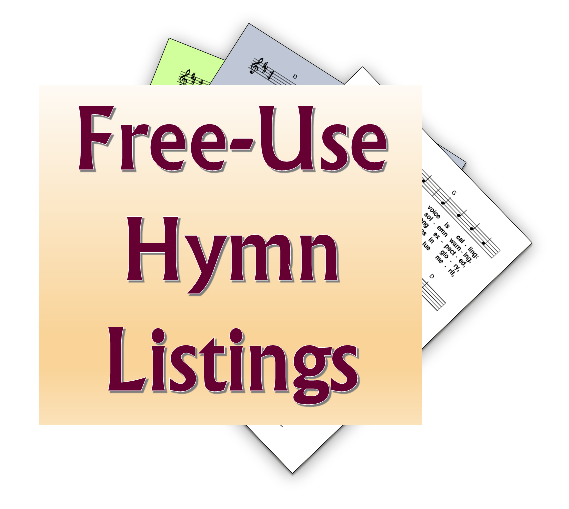 Ideally include (very brief) information about where to find the words and/or music for your hymn. On other websites, look for their preferred way of getting in touch..
Do try to follow the policies of each site. 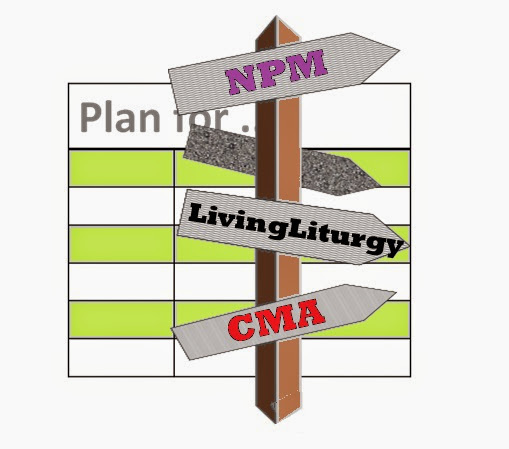 For example, originally the suggestions on LiturgyTools.net were only of public domain hymns that people around the world actually used. Recently this has been broadened to include materials that are still copyright but have a very clear link to the readings or theme. So you will be more successful if you suggest a hymn for two or three days when it is specifically relevant, rather than just suggesting it in general. Various people maintain lists of hymn-writers - ask them, and some will be happy to include you. There are even lists on Wikipedia which you can simply add yourself to. 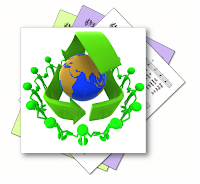 For example "Joe Smith is an American Episcopalian who writes reflective music about ecological issues. His music is available from ..."
This method won't get your a lot of followers immediately - but it will get your website indexed with Google, and so make it easier for people who are looking for you to find you. Some church-musician support organisations have on-line discussion forums. Join these, and at opportune moments, share details of your works. Even if there is a policy against directly linking to your own work, you can refer to it - and people who want to find it can either search, or ask you for the link. There are also Facebook groups and pages which are based on church memberhsip / interest, or local areas. It can be hard to find the right groups or pages: many people from Western countries don't seem to share their spirituality "out loud" on the internet the same way that some people from Asian and African countries do. So you do need to be aware of who is posting and "liking" and whether they are your target audience. This sounds slightly strange - this article is about how to share your material with more people. 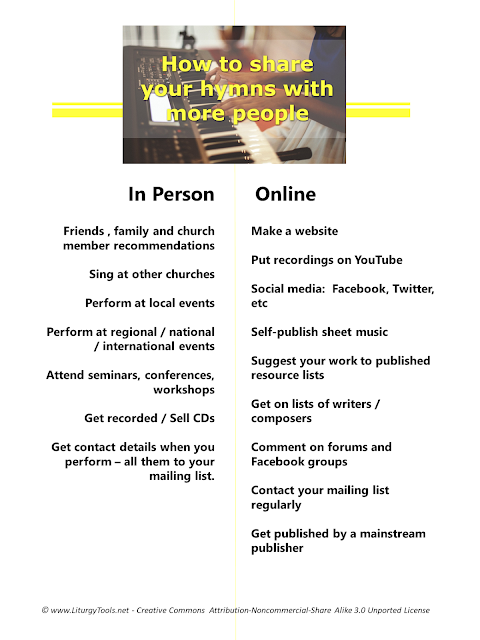 But if you grow a mailing list, then you have a bunch of people who you can contact directly when you write a new hymn in future - or when something happens that your work is relevant for. You don't have to rely on them looking for you, because you can push a message direct to their inbox. So a mailing list is helpful if you are still composing. There are various tools ways to do this: If your list only has a few dozen people in in, you can possibly even use your personal email. More than that, you need a tool like MailChimp. Collect email addresses whenever you speak or perform: ask people for the details and tell them that it's to let them know about new material you are producing. Respect data privacy: people need to confirm that they want to join the list, and need a way to leave it later too. Don't spam people: set an expectation for how often you will contact people, and stick to it. A hymn-writer is unlikely to have a new work to share every day or even week - emailing once a month and actually having something to say is worthwhile than sending weekly nessages with little new information. After all those suggestions about on-line ways of promotion your hymns - it's also important to do in-person, face-to-face promotion. You won't reach so many people. But the connection with the ones you do reach will be far deeper. 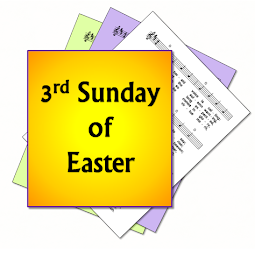 Look for events outside your immediate church where you can share your songs. Ask your pastor / priest / minister to recommend you to colleagues who are running workshops, seminars, etc. Scan newspapers and listings to find out who runs events, and contact them directly offering your services. 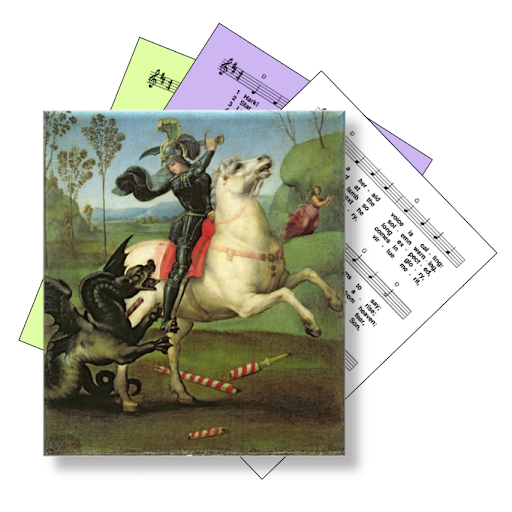 At these events, share your songs - by playing/singing them, and perhaps by giving out wordsheets and/or sheet music. Have some take-away material (business card, flyers, etc), so that people see your name, and can find you again after the event is over - make sure that your contact details are included. 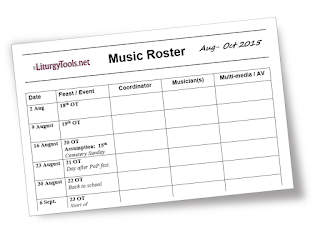 If you also want to promote your services (eg as a singer for weddings or funerals, or for hymn-writing commissions), you may even want to have some small-gift style items (eg pens, note paper, fridge magnets) with your details included. Often you will find that local print-shops can make these - or if you don't have a good local service, you may need to use an online service like Printful. 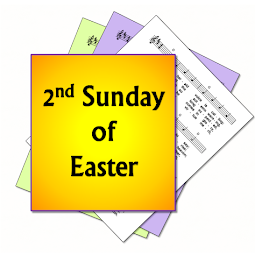 You may have started this already, by creating lead-sheets or even full arrangements of your hymns, and making them available on your website. Consider releasing them through a platform like SMP Press (if you want to sell the sheet music) or Musicaneo (if you want to give it away). This doesn't directly promote your work: although it is on the publisher's website, it's unlikely that a random person who doesn't already know about it will just happen to find it. But it does make you look more professional, and thus makes your hymns more credible. Getting published takes promoting your hymns to a whole new level: a professional publishing company includes your work in their resources, and also promote and distribute it. A set of tips about getting your hymns published in the UK - here. An article about writing hymns and getting published by successful USA-based publisher - here. 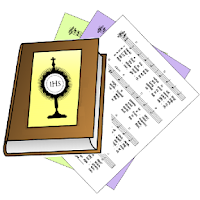 And one suggestion: Write hymns about liturgically-useful things for which there aren't many other hymns. It doesn't matter how good your new setting of Psalm 23 is - there are so many others that yours won't be noticed. But there are scripture passages used occasionally (eg Sundays of Ordinary Time that don't get used every year), for which very few hymns have been written. A passable hymn about one of these may have a better chance of being published than a lyrically and musically excellent setting of a more common item. You might even use a diagram like the one above as a visual "promotions plan": download a printable version, hand-write your chosen specific actions and date for the next month or three onto it, and hang it somewhere prominent to keep you focused. The suggestion above are a starting point - not the end of the story. I've love to hear from established liturgical composers and song-writers about approaches that have worked for them. Please leave a message in the Comments box at the bottom of the page to share your story. 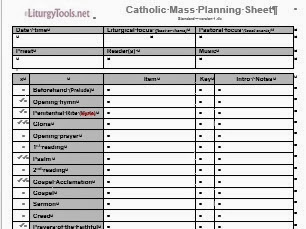 I think it's worth adding a few things for hymn-writers whose intentions are for use in Catholic liturgy. 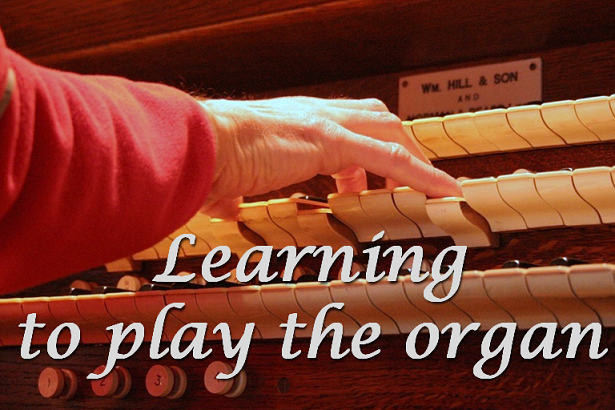 These thoughts follow from noting that musicians will typically be volunteer amateurs with limited time to learn anything complex and most congregations are filled with older people whose voices are more limited than those of the young, and they are often less motivated to learn anything new that doesn't "flow" or offer at least some level of predictability! 1. Use the third person: we / our / us, etc., not me / I etc. Liturgy involves communal worship, not personal adoration. 2. For everything that you expect the congregation to sing, the arrangement absolutely must support the melody; i.e. every note in the melody must be in the arrangement, and harmonies must enrich and clarify the melody rather than muddy it. 3. If you expect the congregation to sing the verses then don't make the melody of each one subtly different. Most people in the congregation can't read music. 4. Lay out all the verse lyrics under a single melody line and wherever possible limit to two pages so there are no page turns. 5. For the parts the congregation is expected to sing, keep the main range C to C; notes outside this range are okay in moderation. A held high E is not likely to work! 6. I'm not a keyboardist, but in my experience most amateur players do not like lots of black keys to press! Two many "filler" notes close together can be a problem too. I hope these are taken as constructive comments rather than being negative - I like good new hymns! But far too many new hymns, even from the main commercial publishers, are not congregation-friendly and don't assist active participation in my opinion.